About Us - Ruane & Mudlock Funeral Home, Inc.
James (Jim) "Sox" Ruane was born January 11, 1926 in Pittston, PA. Throughout his life, he had been a great community servant and leader. As a teenager, Jim worked on the Lehigh Valley Railroad with his father. He also assisted his Uncle J. Leo Tonrey at the Tonrey Funeral Home in Wyoming. After graduation, Jim proudly served his country during WWII as a soldier in the US Army's 86th Infantry. After recovering from wounds received in battle in Germany, Jim and his division were redeployed to the Asian Theater, where he served for an additional year. Upon returning home, Jim earned his degree in Funeral Directing from Eckels College of Mortuary Science in Philadelphia, PA. After graduating, Jim completed his mortuary apprenticeship with the J. Leo Tonrey Funeral Home during 1948-49 and also worked at various other local funeral homes. In 1950, Jim married Mary McGlynn of Pittston and later had a son, Jim. In January 1979, the Ruanes purchased the former John Burns Funeral Home on 18 Kennedy Street in Pittston. In August of that year, Jim partnered with Michael W. Regan and established the Ruane & Regan Funeral Home. Michael would later open a branch office of the funeral home in Avoca, PA. Michael died in 2008, leaving Jim and Paula Regan (Michael's widow) to continue to operate both funeral homes. Jim's service to others extended beyond the walls of the funeral home and stretched to the community in other forms. Jim was a postal carrier for 20 years with the US Postal Service. He worked full-time as a fire apparatus driver until retiring as the Fire Chief in 1992. He also served as a volunteer with Medic 303 and the Greater Pittston Ambulance Association for 58 years. Jim's generosity and compassion for the community he served abruptly ended on May 3, 2012 when he passed away unexpectedly. The Ruane and Regan Funeral Homes continued to be operated by Paula Regan in Avoca and Mary Ruane (Jim's widow) in Pittston. Laura Mudlock is the current owner and supervisor of the Ruane & Mudlock Funeral Home, Inc. Laura is a 1996 graduate of Pittston Area High School. She then went on to study sports medicine at West Chester University earning a degree in Athletic Training. Several years later, Laura went back to school and earned a degree in Funeral Service from the American Academy McAllister Institute of Funeral Service, Inc., NYC. 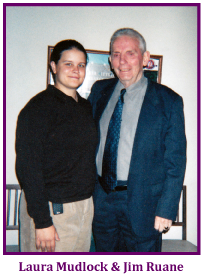 In 1998, Laura began volunteering with the Greater Pittston Ambulance Association where she met Jim Ruane. Laura began working with Jim at the Ruane & Regan Funeral Home and she continued to work alongside Jim until his passing. On January 23, 2013 Laura became the owner of the funeral home located in Pittston and in accordance with state law, renamed the business the Ruane & Mudlock Funeral Home, Inc. (The funeral home in Avoca continues to operate as the Ruane & Regan Funeral Home). Laura chose to keep the Ruane name first and foremost in the funeral home name because of the love, admiration and gratitude she felt toward her "grandfather" Jim. 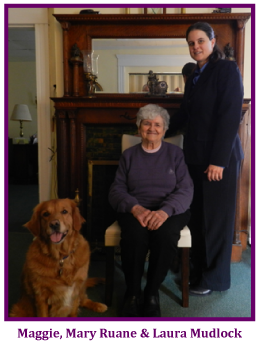 Jim's widow, Mary continues to be a part of the funeral home and is a great help to Laura. Laura remains a volunteer with the Greater Pittston Ambulance Association and is currently employed as the Athletic Trainer for the Wyoming Area School District.